In an article in yesterday’s Times there is a very interesting article by Sir Louis Blom-Cooper QC on the ongoing debate about the candidacy for the twelfth justice of the UK Supreme Court and his views on what or whom the selection panel should be looking for. 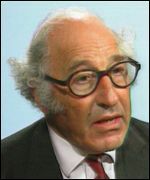 Sir Louis Blom-Cooper QC is the joint editor of “The Judicial House of Lords 1876-2009”, a collection of essays providing comprehensive coverage judicial activities of the House of Lords. This will be reviewed in a later posting. As we have reported in earlier blogs, the selection process is now underway and the position has been advertised, with the selection panel being chaired by Lord Phillips. Sir Louis Blom-Cooper QC debates whether the justices should be taken exclusively from the pool of Court of Appeal judges. Interestingly, 14 of the 112 law lords who have served in the judicial House of Lords were appointed directly. “Of those, at least four gave the most distinguished service to the development of the law: Lord Macnaghten, Lord Macmillan, Lord Radcliffe and Lord Reid” writes Blom-Cooper. A further 13 law lords, including Lord Simon of Glaisdale, have been appointed directly from their positions as trial judges, missing out the intermediate step of the Court of Appeal. Leave a reply on "Sir Louis Blom-Cooper QC on the judicial vacancy in the Supreme Court"